Making it right for you is Music Box Attic's number one priority and you are always at the top of the list. We guarantee that you will have a pleasant, fast and satisfying experience each and every time you shop with us. Our very valuable customers return to us for two reasons, flawless customer service and top quality products!!! Your musical gift purchase is guaranteed for 365 days, no questions asked. Look at what some of the people had to say about their experience, please believe us that the below information is true in all ways, you can browse hundreds and thousands of reviews across the Internet with nearly all being 5 stars and our customers raving about what we do!!! Diamond Girl says - "I am absolutely thrilled with Music Box Attic ' the customer service, the product, the professionalism, the shipping, the personal attention, all top notch! I did post a review and also plan to make another purchase in the next day or so. Thank you verrrrry much. " Pamela says - "This is a great business to order from and I will do so each time I buy a music box which will be a few times a year at least. When there was a mix up on my delivery address which was my fault they were going to have and pay for it to be rerouted to another state as I was going out of state and I would not be at home to get the delivery. It did make it to my home in time, but the item was not what I thought it was. When returning home I contacted them and asked if I could exchange and there was no problem there. I am very big on customer service as I have owned a business and know that if you treat your customers right, and go an extra step or two even if at times the error is not yours they will come back again and again as I will. Thank you Boris, you have been so great!" Bobby says - "I received the music box and it is really, really cool. I appreciate your help so much. This will go down as one of the more creative and surprising things I've given to my daughter and I just wanted to thank you and everyone at The Music Box Attic. God Bless and I really hope you have a wonderful and very Merry Christmas. Best Wishes to All!!! Shirley says � "Very responsive to my requests, even when I needed to change part of the order after it was placed. Also, responded to every e-mail I sent in a very timely and friendly manner. I would higly recommend them." Jennifer says � "My music box is wonderful in everyway and the engraving beautiful. Delivery was perfect and timely." Bryan says � "Fantastic merchant; responsive, polite, helpful and friendly communications, very easy to use and navigate website, very quick delivery of custom tailored mechandise. Cant praise them highly enough. Superb." Jonathan says � "The order was filled and shipped VERY quickly. It was packed tightly and well protected. It is nice to do business with a company who cares about customer service. If I ever purchase another music box musicboxattic will be the first place I look." June says � "Lightning-fast packaging and shipping! My order actually arrived a day earlier than Id expected. The quality of my purchase was top-notch; and it was an excellent shopping experience overall. I will definitely shop with the Music Box Attic again!" Laura says � "The use of the Tune List Listening Room is excellent. All the musician friends who have received these exquisite boxes all remark how excellent the tonal qualities are!! These gifts are breathtaking." Antonia says � "This was one of the easiest purchases Ive made online. Excellent quality. Price was outstanding (I shopped online and in stores) and delivery faster than expected. Music box arrived in perfect condition and plays beautifuly. I highly recommend this site (already have to friends and relatives)." Bonnie says � "In this day of poor service when I have become accustomed to disappointment with merchants (esp. with internet orders), Musicboxattic EXCEEDED my expectations. The music box is beautiful. The engraved placque that I added was perfect - no mistakes. And, the delivery was extremely fast. They also took the time to PROMPTLY respond to an e/mail question prior to purchase. I would highly recommend this merchant." Derik says � "The custemer service was great. the person was very helpfull and friendly. my custum order was great and i recieved it in about a week, from ups ground." C Goodman says � "The product was very well represented and came in a timely way. We are pleased." Jeremy says � "This was the second time I have used this site. Both experiences were great. Purchase was easy and delivery was prompt. Communication from the company also a plus. Their prices would be hard if not impossible to beat. My wife loves her Reuge music boxes. Would recommend this site to anyone looking for music boxes!" Derek says � "Excellent shopping experience all round. Customer service was outstanding. I had several questions and phoned several times and each time I got a very knowledgeable and helpful person to answer questions about the music box. The box arrived when expected. I am very impressed with this company!" Elliot says � "Being an international customer I was expecting this whole experience to have difficulties and delays, but everything was just fantastic. Id do it all again just the same and Id certainly recommend them. Great variety of products, excellent communication, very prompt and efficient shipping, and the product was perfect!" Malinda says � "Had a great experience questions answered promptly delivery on time loved the product will make a great gift got the song I wanted in the box I chose prompt delivery got emails with updates about delivery schedule would purchase from them agian!" Regina says � "Customer service was beyond exceptional! Customer service worked with me one on one to help me order what I wanted at a wonderful price. The quality of the music box was magnificent, and the optional engraved plaque was simply beautiful. I have no reservations at all in recommending this store to all looking for a beautiful product, a great price, and a pleasant transaction." Linda says � "This site is wonderful - easy to navigate and with nice photos of merchandise. I ordered easily, got my confirmations and shipping info. and my merchandise was here PROMPTLY. They have a terific selection of music boxes AND songs from which to choose. I will likely come back to this site for more gifts in the future." Jonathan says � "Great business to work with. Friendly, helpful, and very responsive. Nice merchandise, well packed and shipped quickly. Recommended!" Beth-Ann says � "Music Box Attic was an answer to a prayer. They were easy to use and had more selections than I had ever seen. When I made a mistake with the order, they called to check if I wanted a change. As I spoke with the gentleman, he had my order in his hand and was very helpful. I will definitely deal with them again and would recommend Music Box Attic to everyone." Steven says � "Product exceeded my expectations"
James says � "I had some issues at first contacting the company about my order and had sent an e-mail to cancel it, once it had gone past the original order date. Once I receive a response (the same day), they explained that there had been a death in the family and would make every effort to get my order to me. I bought this for my wife�s birthday and I wanted something that she could pass on in her later years to our children or grand children. I got the music box the day the promised at no additional charge and my wife loved it. The people at music box attic are the best. At a time that has to be very hard on them, they came though for me. I wish them well and hope to do business with them again." Robert says � "Really liked the variety and a really great Web site. Very satisfied with my purchase." Lawrence says � "Boris in Customer Service was quite professional, considerate, and attentive to my needs. The music box is beautiful, and was well priced. I would definitely recommend Muisc Box Attic." Liz says � "We recieved the music box by UPS and what a lovely item. The birthday gift was exactly what she wanted and will treasure for years to come. Thank you!" Deborah says � "The music box exceeded my hopes for sake of utter beauty. Its sound was as good as any Ive ever heard. It was packaged with great care. I have never been prouder to give a gift than I was this music box. I havent heard yet from the recipient, but I can say that I was very, very happy with the product and with the company. I am already planning to shop with them again." Brenda says � "I have purchased two music boxes from the Music Box Attic and have been very pleased on both purchases. The boxes are beautiful. I love the on line ability to listen to the music and then choose the song before ordering. 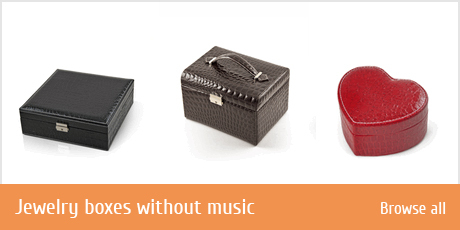 I would recommend Music Box Attic to anyone looking to purchase a quality music box." Suzanne says � "Selections very good and customer service excellent. shipping actually arrived ahead of schedule. The box was a gift which was wonderfully received. Great selection of musical tunes. Thank you." Marvin says � "The music box was beautiful and had the desired effect on the recipient. Thank you." 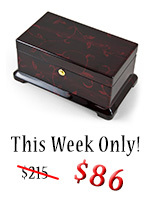 Suzanne says � "If you are looking for a music box, this is the place to buy it! 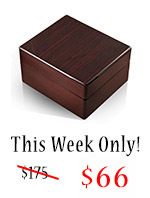 High quality musicboxes at reasonable prices with fast shipping." Daimon says � "Bought a music box from you guys as an anniversary present for the wife. I was worried that shed see the return address and figure it out so I asked if you could block it out so she wouldnt see it, never expecting that someone actually would and preparing to grab it before she could look. When it arrived, the return address name had been blocked as requested. :) The product was wonderful, and both the wife and I loved it. Also, shipping time was exactly as promised. :) Would love to do business with you again. Thanks!" Michael says � "I was very pleased with the quality of the music box and the time it was delivered. I needed it in 2 days to receive it before my daughters 9th birthday and it arrived the day before as promised." Cheryl says � "A great experience all around. Item arrived prior to date desired and tracking was very easy. Would definitely buy from this merchant again!" Douglas says � "Overall purchasing experience was very positive. Website was very easy to use, had a wide selection of products, and provided enough information to make an informed decision. Shipment was handled efficiently and promptly, and product arrived without a hitch. I was very satisfied with the overall experience!" Judy says � "Shopping for the music box was easy and convenient. The price was great and the item was delivered quickly and in excellent condition!" David says � "Were very pleased with the music box. The delivery was just as expected." Robyn says � "when I called the merchant directly to insure stock & delivery (as this was a gift) my call was returned in a very timely manner. Any questions were answered by someone with knowledge about the products. I was e-mailed before & after the shipment came & given a tracking#. Prices were the best I found and beleave me , I visited many sites doing price comparisons, plus the beauty & quality of the music box far exceeded my expectations. All in all a very good experience with this merchant!" Shirley says � "* Extremely friendly and helpful service!! * Very pleased with my merchandise, and will definitely go back for future purchase!" Donna says � "Excellent service and prompt delivery." Michael says � "They were GREAT!!!" Robert says � "Web site was easy to use, the music box arrived on time. the process of tracking the shipment and knowing exactly when it would arrive was very easy to use!" Mary says � "I must say, that I was blow away by the great customer service of this internet store. After I placed the order, a guy called me within a couple of hours to ask me a question about the order. Then, there was a problem with the recepient not being home to receive her present and I got another call from them letting me know that the package was re-routed to the recepients work. I would definitely buy from this store again and I would hightly recommend others to as well!" Barbara says � "I was very pleased with the customer service provided by this vendor. The selection of music for their music boxes is the best I have found, and they were able to place the specified tune into almost any box I selected. I would not hesitate to purchase another item from this company again!" John says � "On-line email support responed to my questions within minutes and continued to stay in contact until all my questions were answered!" Sue says � "Service was prompt and I recieved my merchandise overnight with no problems!" Afie says � "Thank you so much! It is truly a beautifull piece of art. Thank you once again!" Wayne says � "I look foreward to doing more business with Musicboxattic in the future. 5 Stars!" Joyce says � "I recently purchased a music box as a gift from this merchant and the service was excellent! The gift was received two days later and my elderly mother was thrilled. Thank you for a wonderful shopping experience!" Bianca says � "Will be a repeat buyer!" Adam says � "I was very pleased with my shopping experience. The costomer service was great. The only part i had problems with was litening to the tunes as i didnt not have the required program." Meredith says � "I was very happy to find their website to begin with. The site was easyto navigate, and they had a very good selection. I found exactly what I was looking for. The shipping took a few days longer than what was written on the site, but I think it arrived in a timely manner. THe box itself was beautiful and it worked. I know the reciever of my gift is just going to love it. it is a Valentines present. Thank you." Gai says � "Always wonderful service and goods. Nothing seems to be a trouble. I am always more than satisfied." Candi says � "In my opinion, this company went out of their way to accomodate changes I had made to the original order. Not many companies will do this and they did it without a problem. I was amazed by the superb service in that it was delivered in only one day! What a stellar business they have and I will be more than happy to deal with them again!" James says � "we spent alot of time looking on the internet for a musicbox of the quality and design that we liked, before deciding to purchase this one from musicboxattic. We almost waited till the last minute before deadline to get it by Christmas, however we ordered it and the following day I received a call to verify if it was the correct tunes that we wanted and also to reasure me that it would arrive before Christmas. I was happy when it did come as promised and the gift was well received by my wife, it was perfect and Id recommend this company to anybody happy customer!" Nancy says � "I am very impressed! E-mail correspondence was fast and very helpful. Selection and delivery were excellent. Would highly recommend them." Dale says � "THERE WAS A MIX-UP THAT DELAYED MY SHIPMENT AND I WAS CONCERNED THAT I WOULD NOT RECEIVE THE GIFT IN TIME. I CONTACTED CUSTOMER SERVICE AND THEY RECTIFIED IT RIGHT AWAY AND SHIPPED THE GIFT AND PAID FOR ARRIVAL NEXT DAY SO THAT I HAD IT IN TIME FOR CHRISTMAS. EXCELLENT SERVICE!!" Robert says � "Musicboxattic did a great job of fulfilling my last minute order. I was very pleased with the wide selection of boxes and music that I could get. The order was placed two weekends before Christmas and I received it on Wednesday of the following week, using the second-day air option. Very nice! The communication about my order was also very good, as I was able to go on the site and check the status. Overall, a wonderful, reputable site selling very high quality product." Anthony says � "Bought a clearance item and did not expect high quality, instead I was very pleased. I would have bought several had I known. Definitly intend to do repeat buss." Stacy says � "Absolutely the best service Ive ever delt with online!!! Definately purchse from this company!! It is excellent." Nancy says � "I am inpressed! Contact/response via e-mail with a couple of questions was quick, courteous helpful. Delivery was prompt, the product of high quality! Would not hessitate to shop with them again! Highly recommended." Robert says � "Music Box Attic offers great products, and I was very pleased with the quality. I ordered during the busy Christmas season, but received my three products as promised. I will buy from them again!" Luis says � "Body:Ive received my music box in the Canary Islands (Spain) just in nine days: Amazing! The box is beautiful, even better than I expected. Thanks for your wonderful service which I will recommend to my friends. Merry Christmas to all of you in the USA. Luis ." Jim says � "3rd purchase. Very prompt delivery and very satisfied." Hope says � "I am very happy with Music Box Attic. A very nice product. Easy to work with. Very accomodating. Courteous. I look forward to shopping with Music Box Attic in the future. Thank you for a happy transaction!!! Hopesparkie"
Linda says � "The site had a wide variety of music boxes, the options for available songs was clear and extensive, and when I emailed them an inquiry, they responded within 15 minutes, which I thought was excellent. I received the item within a few days and the quality was exactly as described - a small wooden box that felt wonderful to the touch. It does, and I bought it for someone who is going blind. I wanted the tune Silent Night installed, and it was and sounds perfect. 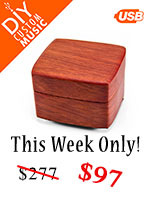 I couldnt be more pleased with this site and plan to pick out a more expensive music box for myself after the holidays." Geoffrey says � "The web site is very easy to navigate, very logically organized, and customer-oriented, making browsing and shopping easy. One can easily navigate quickly to exactly what he or she is looking for. Depictions and descriptions of product are very accurate and helpful. The selection, among both boxes and melodies is great, and purchasing is very easy. Some of the prices are extraordinary buys. The product is of extremely high quality and many shipping options are offered. Unless youre in a hurry, however, the Musical Movement shipping option is more than quick enough. Well-packaged, the merchandise arrived in perfect condition. Excellent place to find a unique and special gift. Superb online shopping experience." Katie says � "Craftsman ship of product was outstanding, as was special request made for purchase. Customer Service was great and right on top of all facets of order and delivery. Thanks, will definitely shop again! Katie." Michael says � "i am 100% satisfied with my purchase!...selection,price and speed of delivery is excellent!...i highly recommend the music box attic!...if you are looking for a great purchase and worry-free online shopping,then this is the place!...i will be back for future purchases!" Patricia says � "I am a repeat customer of this merchant. Delivery is always very speedy, with the merchandise well=packed. The music boxes are of excellent quality. Highly recommend." Vicki says � "Music Box Attic was very helpful with all the questions I had. They were very prompt in their response through email, and very accomodating with the shipping to make sure I had the gift in time for a wedding." Walter says � "I saw it, I wanted it, I bid on it, (MBA says "He didn't really bid on it") I won it, I bought it, I got it! Very easy transaction. I had my merchandise modified fro a reasonable fee. I am very pleased with the quality. I will definately be a repeat buyer." 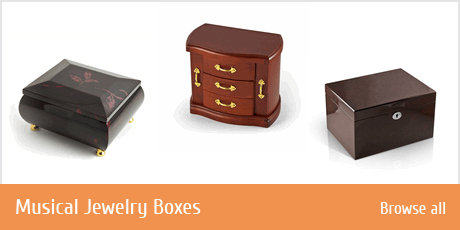 Jeffrey says � "I purchased a musical jewlery box from Musicbox Attic and was very pleased with the quality of the item. It was purchased as a birthday gift for a special someone in my life. The gift brought tears of happiness and joy when opened. If you want to impress your loved one, simply purchase one of these high quality, beautiful pieces that will be cherished for a lifetime. Youll thank me later for it." Mrs. Lee says � "I just purchased a replacement for the movement in my music Reuge Music Box. The service was excellent and the ease of purchase was too. I received my purchase in a great turn around time. I will definitely order from them again!" Matt says � "Personal service. Quick response to questions. Best prices around. I'll definately buy from them again." Ernestein says � "I was very impressed with the level of customer service. It would be nice if all merchants treated their customers with the respect, and attentiveness as I received from MusicBox Attic." Tammi says � "Thanks...the recipient of the music box loved it, thanks for great customer service and timely response to email and questions." Chris says � "I appreciated the fact that the service was quick and my purchase was shipped out the same day as I ordered it. Customer service was friendly and prompt when I inquired about the status of my purchase." Robert says � Very pleased with the service. I had a question before ordering and sent them an e-mail. Their reply was promt and when I ordered the music box, it was shipped almost immediately." Chris says � "Very responsive to questions and delivered on time." Rhonda says � " I received very personal service from Music Box Attic.com. Much more than simple "internet shopping"! They were able to construct a very special gift for me to give my son and daughter in law as a wedding present. The quality of the merchandise, the sound of the music and the price all let to a very satisfying shopping experience. I would recommend this site to anyone wanting a special gift for a special occasion!" James says � �Arrived faster then I expected and was everything I was hoping for. It will make a great wedding present for me bride and will look great in our bedroom for the rest of our lives"
Sheila says � � I am a returning customer and would tell people to shop with MUSICBOXATTIC, they are helpful, they go the extra mile to satisfied your needs. In plain english THEY ARE THE BEST." Charles says � � I am revising my previous rating. I had a problem because I had mistakenly thought that I had ordered comparable music boxes with better quality sound. Instead, I have determined that the prior boxes were 72-note movements and the song that I wanted for my gift only comes in a 36-note movement. I was impressed with how quickly this merchant contacted me and offered to assist in rectifying any problems. As it turns out, I received exactly what I needed. The merchant was most courteous in providing assistance. Being able to communicate with them on the internet and by telephone made all the difference."